Persecuted cartoonists from around the world are in the spotlight this month at London’s Westminster Reference Library, which is hosting the exhibition “Gagged,” featuring “cartoons about censorship and repression of cartoonists from around the world.” The free exhibit is on display through this Friday, Dec. 1. 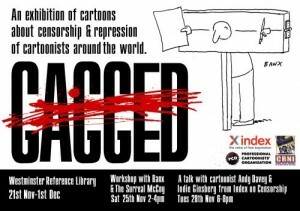 “Gagged” is coordinated by the UK’s Professional Cartoonists’ Organisation (PCO), Cartoonists Rights Network International (CRNI), and Index on Censorship. The library is also hosting two scheduled events in conjunction with the exhibit: a cartooning workshop this past Saturday, and a discussion panel tomorrow evening which will include cartoonist Andy Davey and Index on Censorship CEO Jodie Ginsberg on-site, as well as persecuted Malaysian cartoonist Zunar and CRNI founder and executive director Robert Russell by videoconference. Rich Johnston of Bleeding Cool, who attended the weekend cartooning workshop with his two daughters, has posted some photos of the event and attendees’ sketches. The workshop was led by cartoonists Banx and The Surreal McCoy. Meanwhile, the exhibit itself will be open every day this week from 10 am to 8 pm at the Westminster Reference Library, 35 St Martin’s St, London WC2H 7HP. The panel discussion tomorrow evening from 6-8 pm is also free, but space is limited so attendees are asked to register via the Eventbrite page.